Imagine you are in an office building and the building management system sets off an alarm; it’s too hot! Traditional methods of investigation to uncover the root cause of the alarm can be complicated and time consuming. That’s where VueOps comes in. 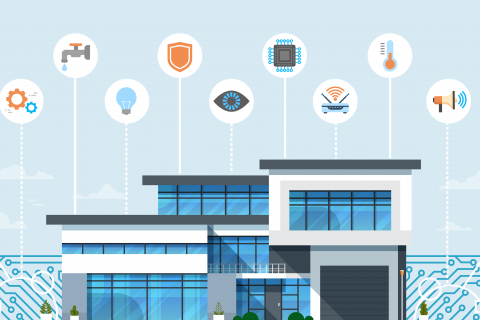 VueOps develops Building Intelligence aimed at addressing the challenges of information and data management. To further this mission, we are happy to announce the release of VueOps Assets, a new software module that brings document-finding and viewing features together with tools that help building owners make better use of data to manage their facilities. The goal: improved facility operations and management efficiency. 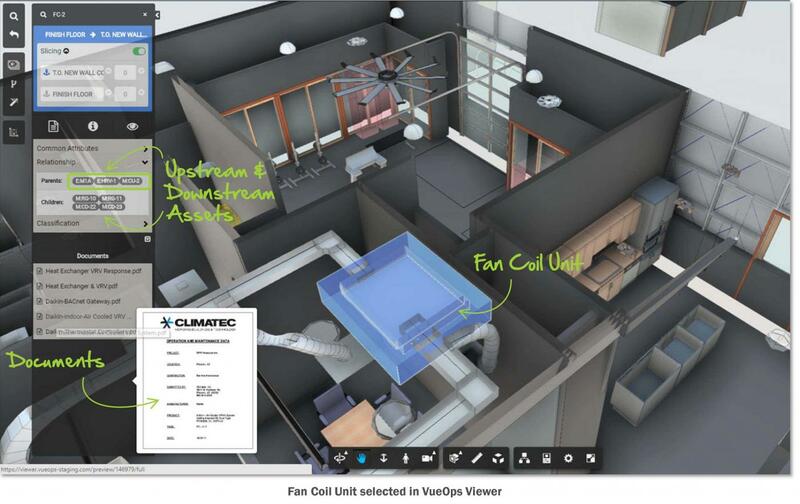 With VueOps Assets, you can easily and quickly find the fan coil unit serving air to the Room, by tracing its path from the room location to the diffuser and then to the fan coil. You can also find the electrical panel that serves power to the fan coil. You can then inspect the data and documents for each individual asset. A simple workflow can help staff understand the connections between assets, review the important data and documents about the assets and then quickly develop a plan that communicates the disruption impact and allows for staff to best schedule the work. The first release of Assets enables teams to deliver an integrated facility database as part of capital project delivery. The database includes and relates assets and asset classifications, systems, spaces/locations, and indexes to the unstructured content in VueOps Documents (Operations & Maintenance Manuals, Warranties, Test Reports, etc.). 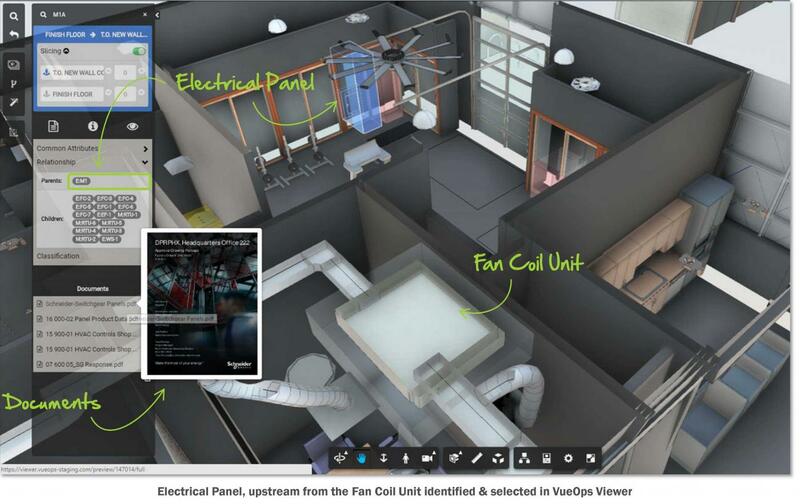 Using Assets, you can easily create and manipulate asset data for your facility. Assets extracts and relates data from CAD and/or BIM. Data can also be uploaded from spreadsheets if there are no models involved. Further, the power of the data is realized through VueOps Search, which enables you to quickly find asset, system and location data, virtually investigate or trace assets that are members of a building system, or provide a service to a system. 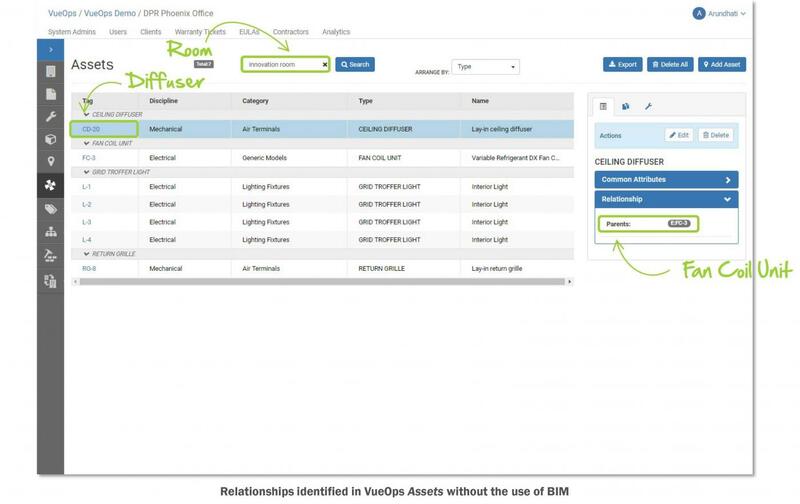 This functionality is available in Assets now; however, it’s just the beginning of VueOps’ journey to create an integration platform that consolidates facility data into one system and integrates with existing systems that manage facility equipment and performance. Reduced time to find the right information for facilities management situations through “Situational” information finding: the right information, at the right time. Want to see VueOps Assets in action? Reach out to the team to Schedule a Demo!